There are those times when we definitely love the outdoors, especially when it’s fall and most part of autumn. Swimming parties and outdoor get-togethers are usually hip and in during this time of year. Summers, yeah – but not really, because all we want to do is bathe in the sun. 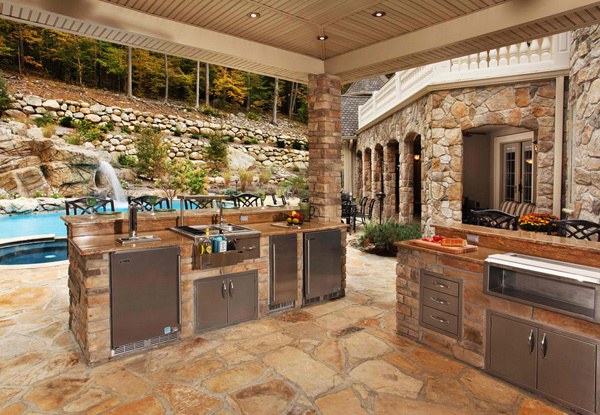 For today, we will be showing you a list of 15 Awesome Contemporary Outdoor Kitchen Designs that will pretty much let you wish it was time of the year to cook those barbecue and grills! Some of the designs range from modular kitchens you can easily install at home or some that needs professional assistance. Without further ado, scroll through the collection and enjoy your browse. 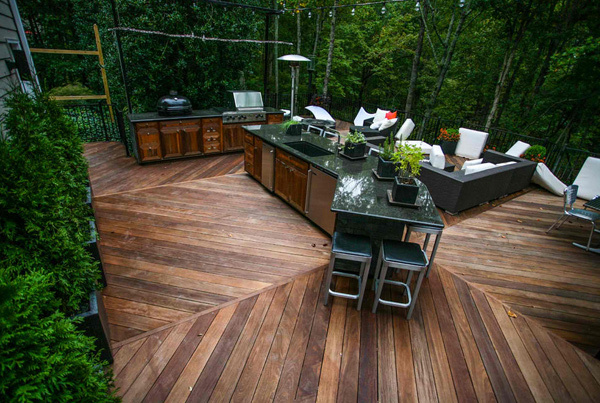 This outdoor kitchen is over the top! Modern kitchen fixtures and stunning nook! The color scheme is superb! Get ready for grilling. 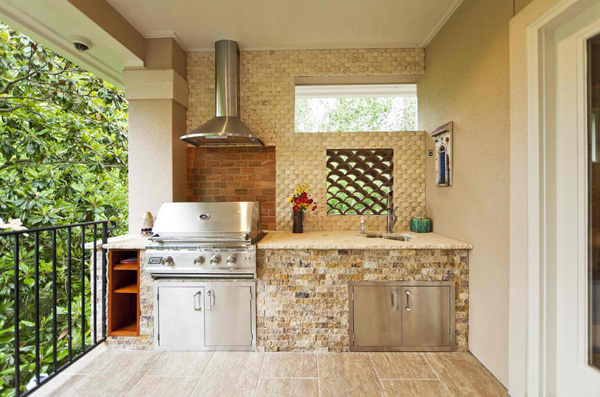 You’re on a cleaning roll; get that grill cleaned out and clean and organize the barbecue tools so you’ll have them close at hand. The French doors may seem silently still on the background, but note that its beauty is just about enough to complement the seating which is just by the kitchen area. 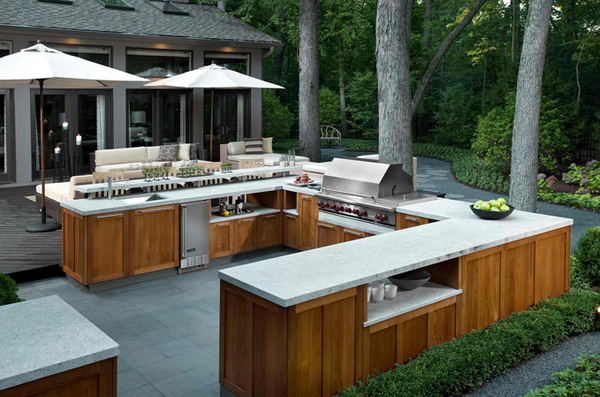 This outdoor kitchen is filled with fabulous architectural details. Crown molding, Arts and Crafts trim and a blue painted ceiling combine for the wow factor. 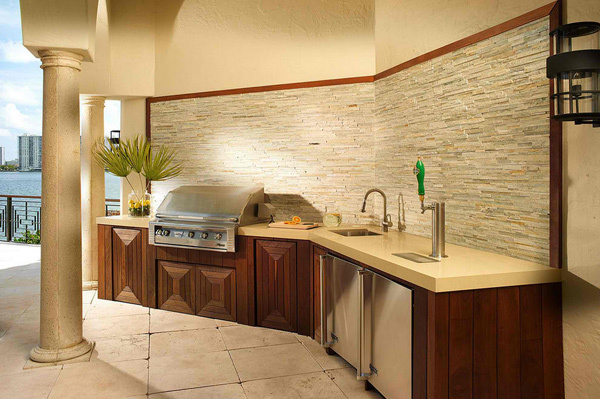 The countertop was done in honed granite and the cabinetry is marine-grade teak. To bring the modern design into harmony with the natural surroundings, a neutral palette was selected to complement the aesthetic inside the home without detracting from the lush green of the outdoor space. We are not sure if there are enough adjectives that we can use to describe this stunning space. 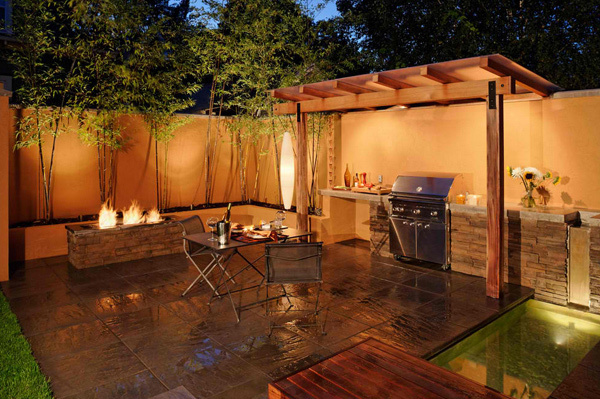 Lighting completed the look that this outdoor kitchen which already extraordinarily perfect. B + G Design, Inc. Put your beer or water tap at the end of the bar. This will allow people to come up to the kitchen without interfering with the cook. Proper placement of the mini fridge is important, too. 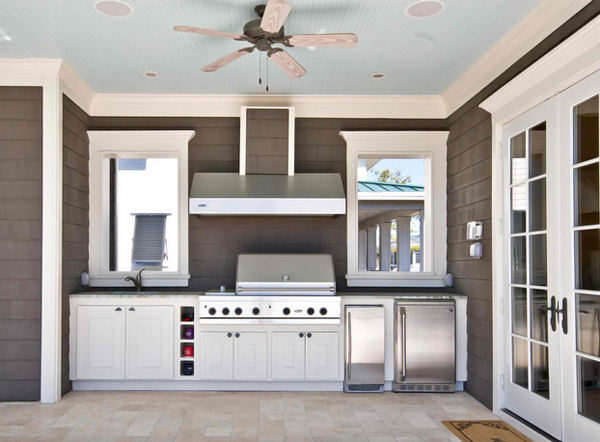 IPE (Brazilian cherry) cabinets & absolute black counters – a perfect set up for you outdoor kitchen. Just what you need to perfectly grill those barbecues you are busily preparing for the weekend. Simple, contemporary design for the appliances you have is the coolest way to go. Direct, functional and useful. 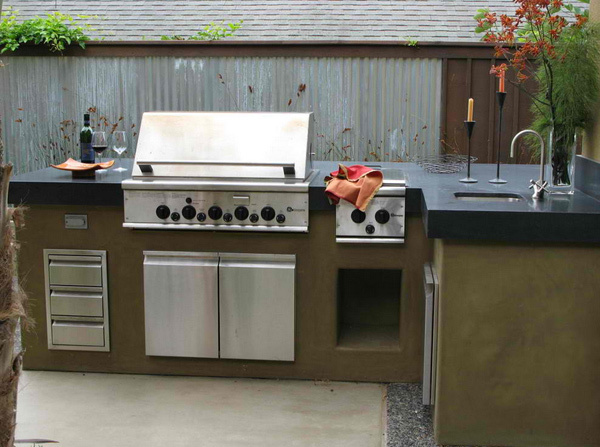 All that an outdoor kitchen should be. 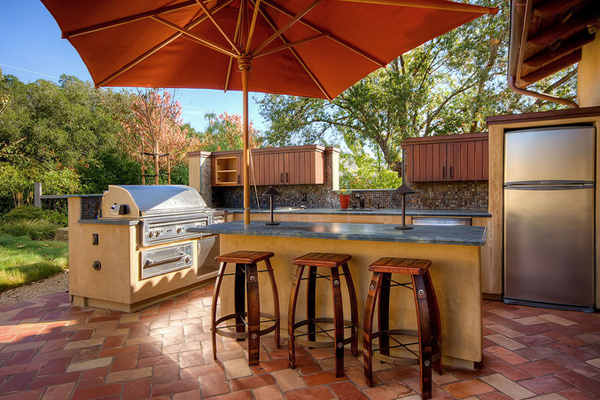 An outdoor kitchen lies on the opposite corner of the patio and pool area. 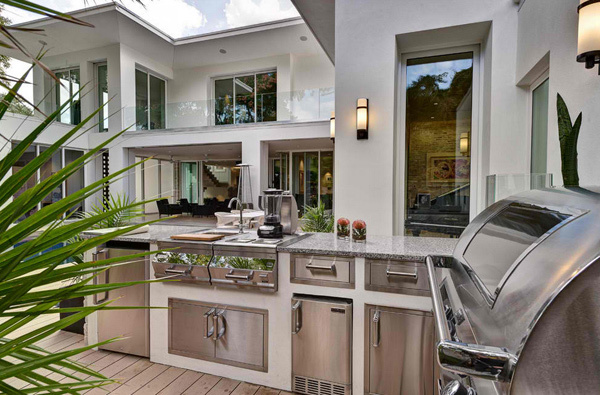 With this outdoor kitchen, the main kitchen, a small kitchen in the gallery and a small kitchen area in the upstairs master suite, the future owners of this show house will never be too far from food and drink! The place is just beautiful. After that quick grill, you can always dive over the pool or hang out with your friends over at the Jacuzzi. All the stones used in this place are plain stunning! Beautiful glass doors open up to merge the indoors and outside into one great flow. 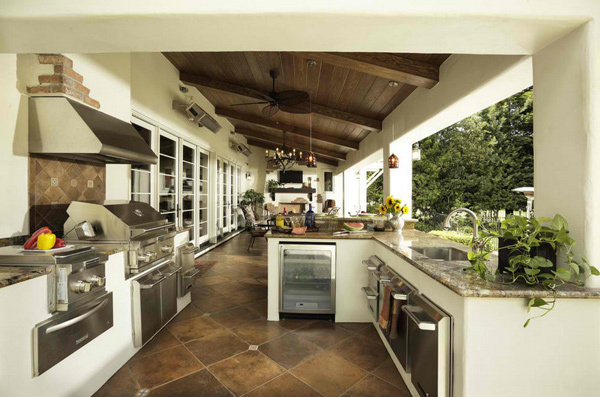 State-of-the-art steel appliances allow for the most sophisticated of cooking. Details like the wood ceiling and floor tiling offer sleekness worthy of chic interiors. The sink in this kitchen is really useful, but even without it, this space will already be heavenly for those weekend plans you made with the kids. 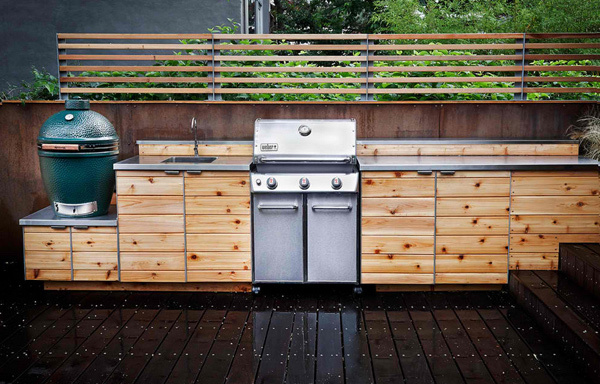 Lewis and Terzi designed and built cedar cabinets to house the outdoor kitchen’s natural-gas grill and smoker. This was the most time-consuming part of the whole project, Lewis says, but also his favorite feature. A trellis and bamboo add privacy. 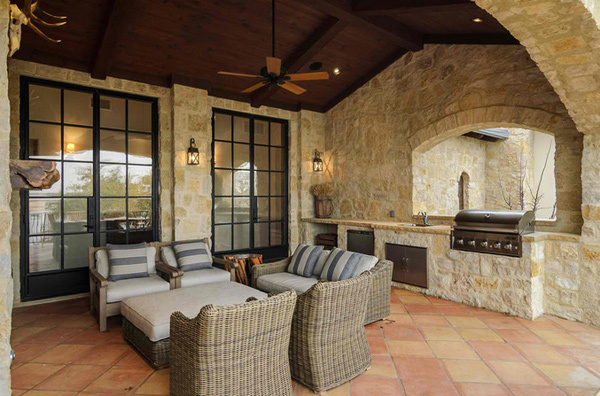 Don’t you agree that this homey look of the outdoors complement well with the contemporary feel that the furniture have to show? 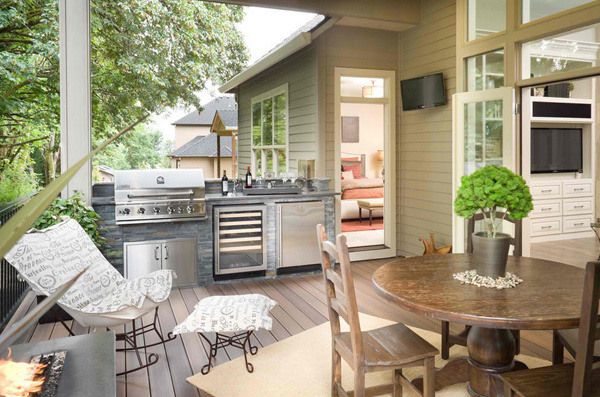 We love the small rocking chair and stool that is stationed just near the grill.
. More to come on Home Design Lover! 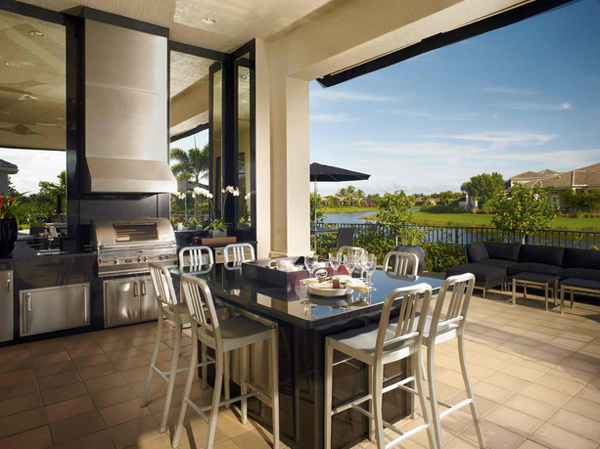 25 Kitchen Design Inspiration: What is the View from Your Kitchen Window?